Kate Schroder heads the Inflammasome Laboratory at the Institute for Molecular Bioscience, University of Queensland, as an ARC Future Fellow. Kate’s PhD studies defined novel macrophage activation mechanisms (awarded 2005). Her subsequent postdoctoral research identified surprising inter-species divergence in the inflammatory programs of human versus mouse macrophages. As an NHMRC CJ Martin Fellow in Switzerland, Kate then trained with the pioneer of inflammasome biology, Jürg Tschopp. Kate has authored more than 70 publications, featuring in journals such as Science, Cell, Nature Genetics, Nature Medicine and PNAS USA, and her work has been cited more than 10,000 times. 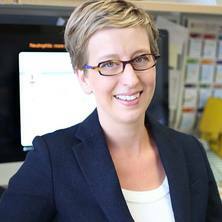 She is the recipient of the 2014 Milstein Young Investigator Award, 2013 Tall Poppy Award, 2010 QLD Premier’s Postdoctoral Award, and the 2008 Society for Leukocyte Biology’s Dolph Adams Award. In addition to her role as an IMB Lab Head, Kate is the Deputy Director of the IMB Centre for Inflammation and Disease Research, and Associate Editor for international journals such as Journal of Immunology and Cell Death Discovery. Our research focuses on understanding how immune cells launch healthy inflammation to fight infection and unhealthy inflammation to promote disease. By understanding exactly how the body fights infection, we can help identify new drug targets or vaccines to combat infectious disease, which causes 13 million deaths globally each year. By understanding how unhealthy inflammation is initiated, we may also be able to design new strategies for the treatment of common diseases such as cancer, gout and diabetes. Expressions of interest from prospective postgraduate students are welcome at any time. For information on future research higher degree projects, please email K.Schroder@imb.uq.edu.au with the following: (1) CV, including a summary of academic qualifications, work and research experience, and publication list; (2) studies report for undergraduate and honours degree(s); and (3) a letter of motivation outlining your research interests. NLRP3 inflammasome activation: The convergence of multiple signalling pathways on ROS production? The NLRP3 inflammasome: a sensor for metabolic danger?